Make your holiday product search easier! If you do not see your holiday represented below, try the links in the navigation to the left under "View by Holiday". Can't find what you're looking for? Try the Search bar at the top of the site and then choose "Search In Store" to limit your search to products. Affordable activity for Easter Sunday! What is Easter Really All About? Ready, Set, Glow! 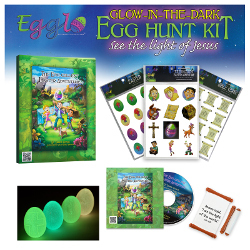 Get this kit for the most fun Easter egg hunt ever! Learn about the heros of the Bible and today! Single Patriotic Lesson Perfect for the Fourth of July!